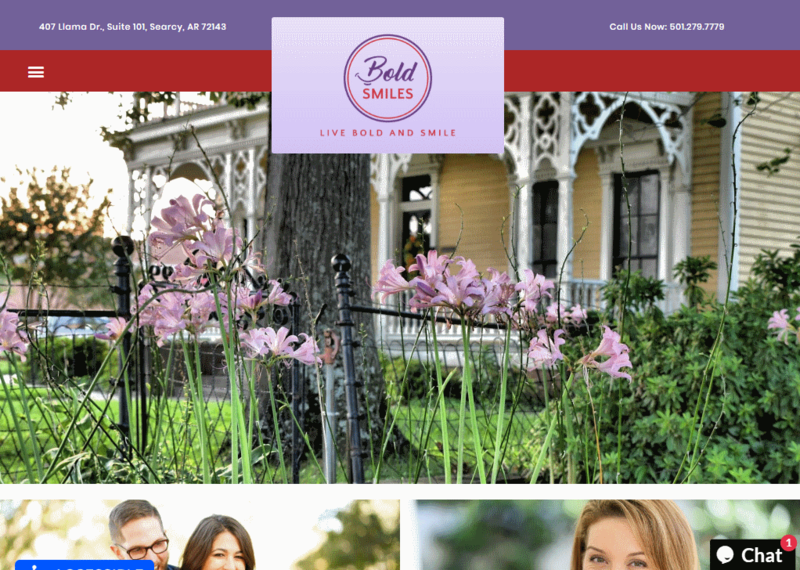 When we were approached by Bold Smiles in Searcy, AR they made it clear they were looking for a site that was visually attractive and showcased the beauty of the part of the country they operated in. Their connection with their community and ability to efficiently provide information to their visitors were hallmarks of this design, resulting in a professional site that provides streamlined access to information and easy navigation. Bold Smiles site brings together stunning color, a slideshow of hero images with breathtaking vistas, and efficiency of design that makes it a delight to view and use. Any potential patient visiting this site will find the information they need to make a decision about this practice available in a single scrolling format, with more in-depth information a click away. The selection of colors for Bold Smiles is bright and engaging without being overstated, with special care given to the shades selected. Sites utilizing red as a primary color have a tendency to get overwhelmed by this bold color, but the conscientious use of it as contrasted against the purple and cornflower blue shades results in a striking appearance that can lead viewers to essential areas. • Contrast – Blue is a popular color in medical websites that provides plenty of opportunities for contrast when used correctly. Purple is often used in web design where blue is present due to its ability to complement and contrast it, and in this specific implementation, it serves as a beautiful tie between the red and blue shades of which it is a product. • Action Oriented – Red is known for its eye-catching nature and ability to inspire action in the viewer. Whether as a result of something in the primeval mind or social conditioning, red drives us to act making it an excellent choice for buttons and vital areas of the site that requires the visitor to take an active role. • Common Themes – Whether we’re looking at an image of the Searcy’s natural beauty or a photo used to highlight a source of additional information, the color themes are present throughout. From the red present in a beautiful sunset to the blue in a smiling husband’s shirt, the color pattern repeats itself throughout the site. The photo of Dr. Bolding is an excellent example, with blue, purples, and reds visible through his bio profile picture. • Space – Bold Smiles website is built with a streamlined and compact presentation without being overcrowded. Each part of the site is apparently broken into sections that provide specific information and directs the viewer to further information. • Navigation – Navigation of the site is as simple as scrolling. While the hamburger menu is visible in the upper-right hand corner navigation options are open to the viewer at every turn. Want to learn more about Cosmetic Dentistry? Simply click the photo. Want to learn more about Dr. Bolding? The Bio button is presently visible. • About Us – Presented under the headline of “Meet Us,” the About Us section clearly indicates the investment that Bold Smiles has in its community. From an expression of faith to a statement proclaiming their dedication to compassion and quality you get a clear introduction to Dr. Boling and his staff. • Contact Information – Contact information is present without being obtrusive, quietly yet prominently settled in the header that remains with you as you scroll through the site. If you’re looking for immediate answers, it’s clear their ready and willing to hear from you. There are a few standard practices in the Bold Smiles website that helps drive conversion, starting with the striking homepage with its rotating banner of hero images. The constant availability of contact information means that the viewers can easily contact the office the second they decide to, without having to look around. This is further aided by the hamburger menu’s presence providing rapid navigation of the site, including to the all-important Contact Us page.